When it’s time to choose an anniversary gift for your pastor and wife anniversary, keep the following in mind: meaningful, substantial, long-lasting. Marriage is a holy union, one to be celebrated and reveled in. Your pastor and his wife have a unique bond in marriage. They must share their free time with an entire congregation. Their quiet moments are often interrupted by obligations to the church. A pastor and his wife must be devoted to God and the parish they serve, as well as each other, which is why brainstorming gift ideas for pastor and wife’s anniversary is such a weighty task. Just the idea of a wedding anniversary is cause for reflection. Looking back over happy marriage memories, remembering the exciting moments of the big day, day-dreaming once again about that perfect proposal or the early days of dating. Most married couples have a wedding album full of posed and candid shots from the ceremony and reception. But what about a memory book compiled by members of the church and old friends? Organizing this exercise is easy. Ask every church member as well as friends and family members of pastor and his wife to select a single photo. Encourage people to dig through their archives so the project is a mix of old and new photographs. On a piece of heavy cardstock, have each person write the date the photo was taken, the location and a single sentence. This can be an anniversary quote, a line of poetry or a summary of the memory. Compile all of these and preserve them in a beautiful album, leaving space on the last page for a photo from their anniversary party! Substantial is a word a lot of companies and manufacturers like to throw around when they’re trying to convince you to buy their product. But what does substantial really mean? It implies a material that is of a high quality and a design that showcases as much. But there’s also an intangible quality to the word; a substantial gift has to matter, has to be something permanent and worthy of display. 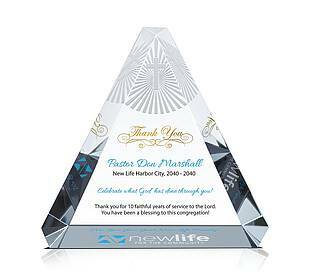 When you’re considering gift ideas for pastor and wife’s anniversary, a crystal keepsake is an original, substantial way to honor the happy couple. 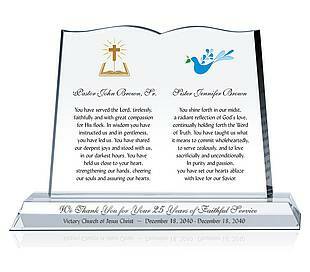 Pastor and Wife Gift Plaque: This gorgeous crystal bible can be personalized with free deep-etch engraving to highlight the beauty of a wedding anniversary. Its lovely design and ample space for inscription make it an ideal gift. Pastor Anniversary Gift: This beauty can be used to mark a pastorship anniversary but can be easily customized for pastor and wife’s anniversary. The beveled edges and milestone number up top are gorgeous details. You have numerous choices here with a number of personalization options so have fun designing away! When sifting through gift ideas for pastor and wife’s anniversary, don’t get stuck on a “gift of the moment.” A trendy piece of technology, clothing, traditional gifts like flowers and candy don’t stick around. On the other hand, when you present an honoree with a hand-made gift, or present pastor and his wife with a beautiful crystal monument, those gifts stand the test of time. Helping your pastor and his family make a new memory is another way to go, so sending a deserving couple on a romantic getaway is also a wonderful option.